JSP Declaration tags are used to declare variables, methods, fields. The tags are written inside the JSP page and placed outside the _jspService () and are auto generated by the JSP container. In JSP static member, instance variables can be declared in the declaration tag. The declaration of declaration tag can be represented as follows. JSP Declaration – The fundamental contrast between the declaration and script is that exclusive variables will be composed inside the JSP Scriplet and set within _jspService (), whereas in JSP Declaration both variables and methods will be composed and put outside the _jspService (). The advantage of declaration tag is that it can have variables and methods. Inside the body tag one can write the HTML code or JSP code, both will get execute on the server. Where in the JSP declaration tag mentioned String to display the message that written in the code. Where in the scriplet tag mentioned the output line. After executing the above code successfully, output will be as follows. The jsp declaration tag can declare variables as well as methods. The jsp scriptlet tag can only declare variables not methods. 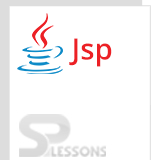 The declaration of jsp declaration tag is placed outside the _jspService() method. The declaration of scriptlet tag is placed inside the _jspService() method. JSP declaration tags will be placed out side the _jspService() method. Inside the declaration tag variables and methods will be written. While requesting declaration tag won’t get memory.